Chuckles is back! 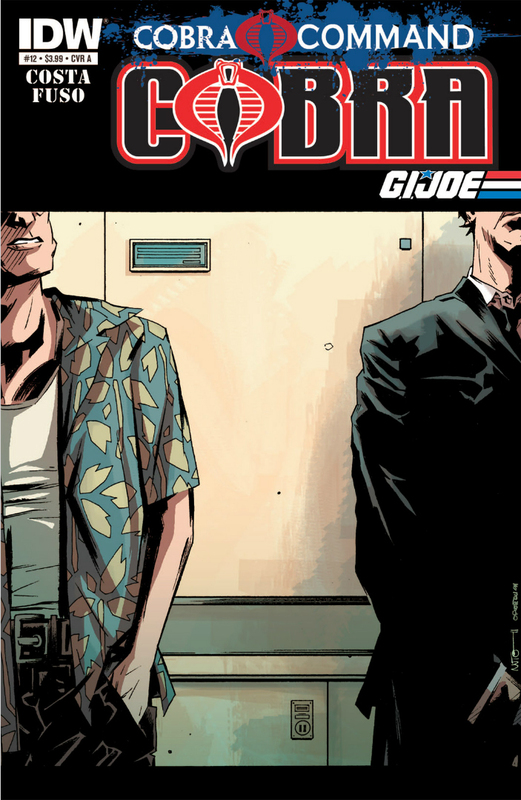 (sort of...) In Cobra #12, Mike Costa and Antonio Fuso bring the Cobra series back full circle as Hawk, in his last hours as commander of the Joes, reads Chuckles' last mission report. Since the start of the Cobra Command story, the last nine issues of the collective Joe titles have been non-stop action. This month's issue of Cobra, like this month's issue of G.I. Joe, hits the brakes and lets characters' narratives take the forefront. Both issues deal with the departure of Hawk from command.While G.I. Joe is from the perspective of the other Joes with a view to the future repercussions, Cobra deals with the dirty secrets swept under the carpet 24 months ago.Unlike its sister title, though, Cobra examines Hawk under harsh, unflattering lights. Costa does here what he does best: detailed, nuanced, and fascinating character developments. The central characters here are Chuckles and Hawk: one narrating his last mission brief as he's about to lose his life, and the other reading that mission brief as he's about to lose his command. We get a lot of background on Chuckles (not surprisingly, little of it is as happy as his code name might suggest).We also get a lot of Chuckles' analysis on who Hawk is (little of that is pretty either).We can wonder how much of Hawk Chuckles really knows, but the fact that Hawk is still reading his report two years later shows that Chuckles had at least some things right. Chuckles' one-sided conversation isn't kind to either Hawk or himself. The anger Chuckles felt for Hawk because of how he and Jinx were so callously played as pawns is still palpable. There is no closure here, no forgiveness, no "I understand what you had to do." Although, just like in the final stage of grieving, there is a level of acceptance from Chuckles, both of Hawk's role in this elite force, and Chuckles' own duties in his final hours. We get little reaction from Hawk from Chuckle's brief. Interspaced with Chuckles' narration is Hawk interacting with the support staff at the base, including a conversation with Chameleon in which he basically convinces her she has no option but to stay in the fight (foreshadowing Hawk's own eventual return?). His only reaction is, ironically, a chuckle from his agent's last joke, suggesting that, like Chuckles, he accepted his own role, however ugly and bloody. It was absolutely fitting that Antonio Fuso be given the art reigns for this retrospective issue. It was his style that helped give Cobra and Cobra II that noir feel that perfectly set the tone for those series.Objectively, however, I have to ask myself if I enjoyed the art in this issue because of how much I enjoyed his work in the past.After having Alex Cal draw the last three issue of Cobra, Fuso's work looks very angular and disproportionate in comparison. The contrast is jarring.Hawk looks nothing like his appearance in this month's G. I. Joe.Don't misunderstand me, I enjoyed the art in this issue a lot, although I may be prejudiced because of my love of his previous work.It's great to see Fuso draw Chuckles once again.I just wish he had spent a little more effort realigning his versions of characters in this book to their current appearances in the other books. As interesting as Krake is as the new Commander, I still find myself curious about who donned the mask prior to him.In a "blink and you may miss it" factoid, we learn that the previous Cobra Commander held that title for 35 years. My unscientific survey of current readers of IDW Joe comics suggests that Gage's and Costa's Cobra and Cobra II series are considered among the best Joe comics in recent history. No small part of that was due to the breakout characterization of Chuckles.Aptly, Costa deals with the aftermath of Cobra Civil War and Cobra Command by examining the two men who, in part, set these events in motion. What this issue lacks in action, it more than makes up for in deep and intriguing characterizations.Like Hawk himself, I will be re-reading this issue multiple times, trying to squeeze every last bit of information from it.And like Hawk, I will be re-reading it as a goodbye to a phenomenal character.Very Highly Recommended.